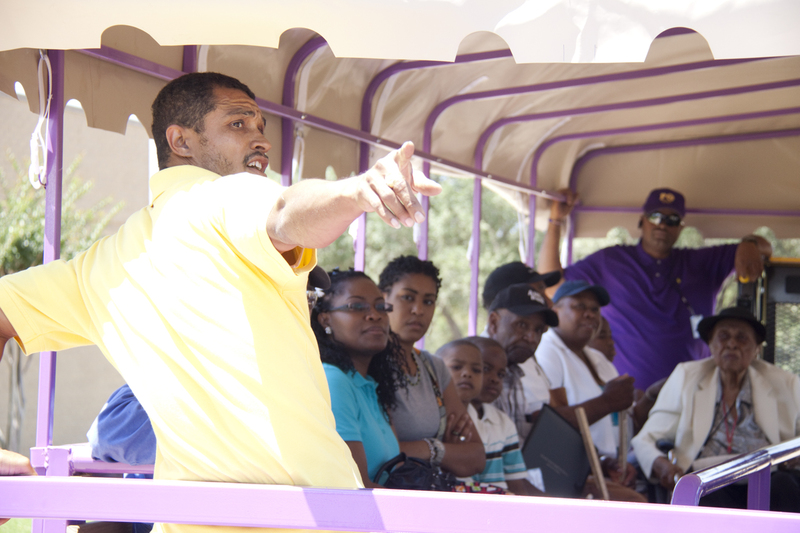 PRAIRIE VIEW, TX – Since 1983, Prairie View A&M University’s College of Agriculture and Human Sciences has held the Agricultural Field Day to give small scale agricultural producers the tools needed to help them sustain and maintain their farm, goat and ranch operations. The Field Day also helps new and upcoming individuals find their niche in non-traditional operations such as organic farming. The 2011 Field Day, held March 7 on campus was no exception. Starting May 6 with a pre-Field Day workshop on “Farmscaping”, the process of using biological and organic toxic controls in commercial crop production, Dr. Richard McDonald of Symbiont Biological Pest Management in North Carolina, hosted approximately 40 participants in this one-day seminar. McDonald conducted field studies on the University Farm that focused on farmscape design, habitat development, insect collection and beneficial insect release. Participants watch intently as Dr. Richard McDonald explains "Farmscaping" techniques. Farmers, ranchers, community gardeners, goat and beef cattle producers, and other interested individuals started registering early on May 7 for the start of the Field Day events. Activities started with greetings from the mayor and university and USDA officials—Dr. E. Joahanne Thomas-Smith, provost and senior vice president for Academic Affairs, Anderson Neal, deputy director, USDA – Office of Advocacy Outreach, Washington, D.C., and Frank Jackson, mayor of Prairie View. Dr. Thomas-Smith applauded the College of Agriculture and Human Sciences’ academic, research and Extension units for carrying on the tradition of uplifting agriculture and the human sciences to its students and clients. Neal, a native Arkansan, said it was his first time visiting Prairie View A&M University and was glad to see the outreach that was being made to assist small scale agricultural producers. Neal also explained the five programs operating in the Office of Advocacy & Outreach saying that the 1890 institutions are included in the Higher Education Institution Program. Immediately following the opening session, participants went to their selected workshops to get up close and hands-on training. Workshops included Food Safety, Goat Judging Basics, Diseases of Pregnant Goats, Matching Nutritional Needs with Forage and Hay Quality for Beef Cows, Internal Parasites in Goats, Pasture Management, Using the “Grazing Stick” and General Goat Management. Justin Duncan, University Farm greenhouse manager, gives participants tour of University Farm. 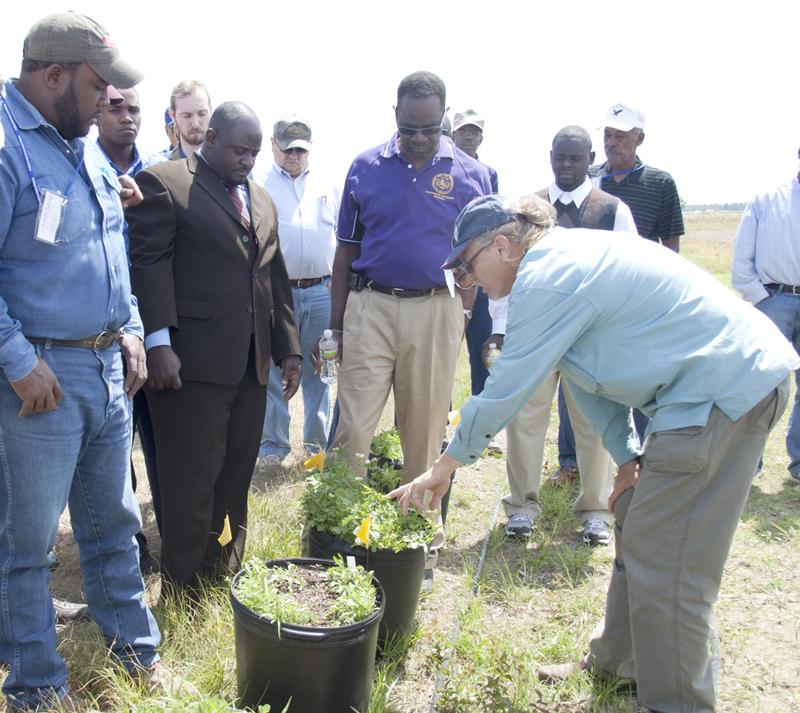 The College of Agriculture and Human Sciences continues to show the importance of agriculture to Prairie View A&M University’s land-grant mission of teaching, research and service. Agricultural careers can be as diverse as nutrition education, dietetics, agricultural economics and agricultural communications, however, the primary goal of the Agricultural Field Day was to focus on farming and ranching needs. “This Agricultural Field Day was very beneficial for me, especially in the areas of organic gardening and the processing of livestock, said Willie Brown, Field Day participant. During the workshops the participants received hands-on training and applicable information to use in their farm enterprises. Delahoussaye— graduate student in Human Sciences, Debra Elder—junior majoring in Biology and Ashley Moore—graduate student in Human Sciences, won first or second place in the Poster Competition held recently at the Association of Research Directors conference. A favorite activity of Agricultural Field Day has been the Goat Barbecue contest. To add a twist to this year’s contest, a Goat Cook-off was held where entries were accepted for all types of prepared dishes made with goat products, including cheeses, stews and meat dishes. Winners of the Goat Cook-off were Swede Farm—Waller, Texas for their Specialty Goat Dairy entry and The Three Panthers –Montgomery, Texas for their Grilled Meat entry. 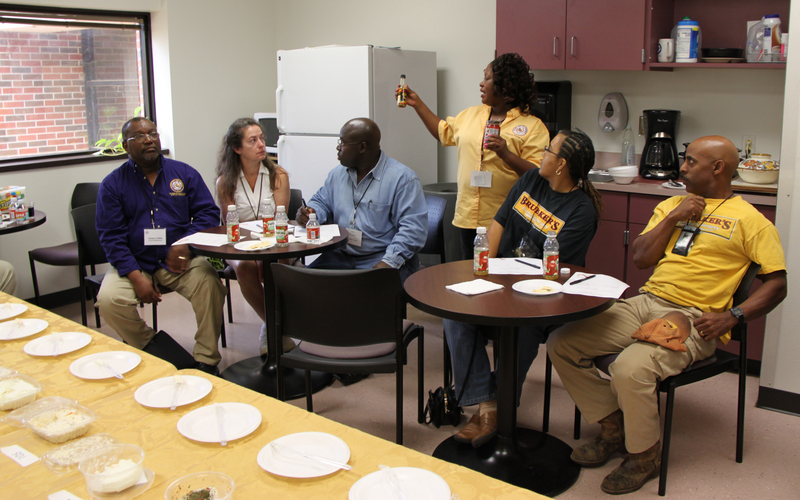 Jackie White, standing, program specialist - Family & Consumer Sciences - Cooperative Extension Program, explains the next food tasting entry for Goat Cook-off judges. “We were certainly pleased with the turnout this year and look forward to next year’s event,” said Lawton. Contact Billy Lawton at 936/261-5117, bclawton@ag.tamu.edu or visit http://pvcep.pvamu.edu for more information about the Agricultural Field Day. This entry was posted on Thursday, May 12th, 2011 at 4:43 pm and is filed under Agriculture and Natural Resources, General CEP News. You can follow any responses to this entry through the RSS 2.0 feed. You can leave a response, or trackback from your own site.